New Orleans I had a scheduled call yesterday with a young man, now in the Bay Area of California, who had read something I had written, sent me an email, and asked if I would be willing to talk to him about “tactics,” as he called it. The call turned out to be wide ranging and focused more on how he could become more actively involved in community-based social change. Nonetheless, it got me thinking about tactics, especially as I read the headline involving the president, the border wall, and the federal shutdown, all of which are something of a case study in tactics, perhaps with a strategy and possibly without one, since we are talking about President Trump and that must always remain a question. The partial government shutdown was a Trump tactic in itself obviously. His initial announced intention was to use the tactic of the shutdown to pressure Democrats into putting up $5 billion or more to build his “beautiful wall.” He misjudged on that one, because he was trying to force negotiations, and there was no incentive on the part of the Democrats to negotiate when they were weaker than they would be when they gained majority control of the House of Representatives. In actual meetings with the Democrats, his tactics are both obvious and confused. Announcing the breakdown of another set of discussions, his people said there had been great progress, while the Democrats said he had threatened to keep the government closed for “months, maybe years.” This is classic high-low bargaining. He was clearly bluffing, and the Democrats knew that but were trying to tactically increase public pressure on the president by turning his bluff upside down, while he was trying to signal to his base that things were in hand. Clearly this was a bullying backfire. Another tactic he tried that didn’t work was having his departing chief of staff, former general Kelley, claim that the wall wasn’t a physical wall and hadn’t been for some time, but was something more on the order of a metaphorical barrier. Trump has been quoted going back and forth on whether this is a “real” wall during this period as well. None of which helped his bargaining position. Using a lame duck to signal some movement in negotiations is ridiculous, and bouncing back and forth on your demands also undercuts your position. The real signal he’s giving is that he doesn’t know what he wants and is bargaining in bad faith and hoping for a break from his base or the public. He may think it is good tactics to confuse the opposition at the bargaining table, but those are never tactics that can produce an agreement. His tactical threat to declare an emergency and autocratically try to impose the expenditure and wall construction is more interesting and more dangerous. 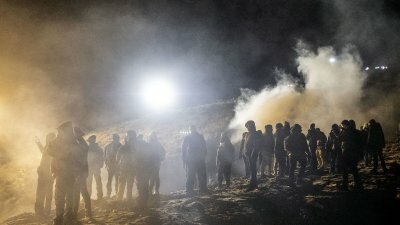 Federalizing troops and several incidents of tear gassing migrants at the border, I would argue are deliberate tactical provocations being engineered to lay the groundwork for a legal position that defines dictatorial actions from the White House as an emergency triggering the exceptional use of such power. Migrants at the border are desperate, not disciplined, and making their point as a protest. No one believes than any group of 100 or 1000 migrants are going to be able to successfully break through border security. Tactically, Trump and his people are hoping to exploit their weakness in order to have a stronger threat at the table to force the Democrats to concede. The price is high, but his tactics here are very, very smart and very, very scary. All of this not only proves how dangerous Trump is, but also how dangerous it is to underestimate him and his people. Anytime there is a situation where tactics are divorced from long term strategy and only targeted at short term objectives, like we have in this case, we are all in perilous times and unable to protect ourselves and the country from the calamities that lie ahead. This entry was posted in Ideas and Issues and tagged border security, mexico, tactics, Trump Administration by Wade. Bookmark the permalink.